Spidey spotlight: After weeks of chilly summer boxoffice weather, Hollywood finally got some superhero help to heat up ticket sales. 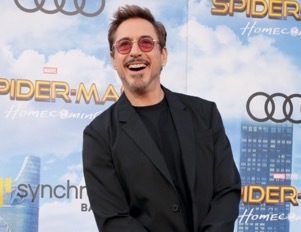 Last weekend's $117 million launch of Sony's Columbia Pictures, Disney's Marvel Studios and Pascal Pictures' PG-13 rated 3D sci-fi action adventure "Spider-Man: Homecoming" at 4,348 theatres was the good news theatre owners were hoping for. "The well-reviewed film is the talk of the social media landscape, topping comScore’s 'Most Talked About Movies' charts for the past three weeks," comScore senior media analyst Paul Dergarabedian said Sunday morning. Spidey also got off to a strong start internationally, grossing about $140 million in 56 territories for a worldwide cume of about $257 million. It should continue to sizzle internationally since key Asian markets like China and Japan and top European markets like Germany, France and Spain haven't opened yet. Since "Wonder Woman's" June 2 debut to $103.3 million, a string of fizzled franchises has plagued the multiplexes. Fewer admissions mean fewer sales of overpriced tubs of popcorn and other concession stand snacks. Those are major revenues that exhibitors don't have to share with the studios. Even with "WW" and "Homecoming," the long chilly summer has erased the positive year-to-date boxoffice comparisons that Hollywood was generating throughout the spring. For distributors, the under-performance of so many aging franchises has called into question Hollywood's basic strategy of betting the farm on making new ultra-costly tent-pole episodes to perpetuate long familiar series. Directed by Jon Watts ("Cop Car"), "Homecoming" stars Tom Holland (as Peter Parker and Spider-Man), Michael Keaton (as Adrian Toomes and Vulture), Robert Downey Jr. (as Tony Stark and Iron Man), Chris Evans (as Steve Rogers and Captain America) and Marisa Tomei (as Aunt May). "Homecoming's" the sixth episode and second reboot in the Spidey franchise that kicked off in 2002. The series' first five episodes grossed $1.58 billion domestically and $2.4 billion internationally for a worldwide cume of $3.98 billion, according to comScore. In comScore's Most Talked About Movie research for June 26 through July 2, "Homecoming" ranked first with 2,675,624 cumulative conversations and 345,657 new conversations five days before release. comScore said these were measured through its Pre-Act – "a tracking service utilizing social data to create context of the ever-evolving role of digital communication on feature films." There also was good advance word about "Homecoming" from Fandango, which said last Thursday that the film was "finding a home at the top of Fandango’s weekend sales and Fanticipation movie buzz indicator with 97 out of 100 points. As of Thursday morning, 'Homecoming' is outpacing 'Wonder Woman' at the same point in the Fandango ticket sales cycle. "According to a Fandango survey of more than 1,000 'Spider-Man: Homecoming' moviegoers: 89% are more excited to see 'Homecoming' because of Holland's credibility as a high school character. 87% have seen multiple 'Spider-Man' movies on the big screen. 86% are fans of Robert Downey, Jr.; 70% are fans of Michael Keaton." Fandango says Fanticipation, "provides statistical insight into the movies fans are planning to see in a given weekend. Fanticipation scores (based on a 1 to 100-point scale) are calculated via an algorithm of Fandango's advance ticket sales, website and mobile traffic, and social media engagement." Besides its strong social media tracking, "Homecoming" also got some help from its 93 percent fresh score on Rotten Tomatoes. Unlike the aging franchises with rotten RT scores that fizzled earlier this summer, the rebooted Spidey dazzled many critics. Ironically, now that people don't seem to be reading newspaper and magazine reviews, they're increasingly motivated to buy tickets by RT's aggregate critics scores. A likely factor in this surprising equation is that now that RT's owned by the movie info and ticket sales company Fandango, all those RT percentages are staring people in the face as they decide what to see. Given the high cost of moviegoing today (especially for family groups going to see 3D movies), RT scores have become an instant consumer advisory before buying tickets. Another key want-to-see factor contributing to "Homecoming's" powerful opening is that for the first time Spidey is being played by an actor who's actually the right age for the part. Tom Holland was only 19 when he was cast as Peter Parker, who's supposed to be a 15 year old high school student when he's not bouncing around town in his Spider-Man costume. By comparison, Tobey Maguire was nearly 27 when "Spider-Man" opened in 2002 and Andrew Garfield was pushing 29 when "The Amazing Spider-Man" reboot opened in 2012. While both certainly came across as being "young," neither really looked like a 15 year old. Holland, who just turned 21 in June, has a very youthful look that helps him connect with young moviegoers. It's easy for his peer demographic to identify with him. This heightened believability of Holland as Parker/Spidey was a likely factor in prompting critics to applaud the film's believability. It's a big plus for Marvel & Disney, Sony & Columbia and Spidey fans that the two studios put together a deal to reboot the franchise and produce "Homecoming" together. That enabled Marvel to integrate this legendary character into its Marvel Cinematic Universe. Holland debuted as Spider-Man in Marvel & Disney's 2016 blockbuster "Captain America: Civil War." He's putting on his Spider-Man spandex next for Marvel & Disney's "Avengers: Infinity War," opening May 4, 2018. The next Spider-Man episode is reportedly going into production next spring. It's presently untitled, but the buzz is that the number "2" won't be part of the title. Directed by Anthony Russo & Joe Russo (directors of "Captain America: The Winter Soldier" and "Captain America: Civil War"), "Infinity War's" all-star cast includes: Karen Gillan, Tom Holland, Brie Larson, Scarlett Johansson, Chris Pratt, Robert Downey Jr., Zoe Saldana, Chris Evans, Vin Diesel, Benedict Cumberbatch, Pom Klementieff, Chris Hemsworth, Cobie Smulders, Bradley Cooper and Peter Dinklage. "Transformers: The Last Knight" (15 percent/$118.9 million), "The Mummy" (15 percent/$78 million), "The House" (18 percent/ $18.6 million), "Baywatch" (19 percent/$57.6 million), "Diary of a Wimpy Kid: The Long Haul" (19 percent/$20.5 million), "King Arthur: Legend of the Sword" (28 percent/$38.9 million), "Pirates of the Caribbean: Dead Men Tell No Tales" (29 percent/$168.8 million), "Despicable Me 3" (62 percent/$149.2 million), Cars 3" (67 percent fresh/$133.7 million) and "Alien: Covenant" (71 percent Certified Fresh/$73.8 million). On the other hand, top tier fresh scores are matching up these days with boxoffice success – like "Baby Driver" (97 percent/$56.9 million), "Wonder Woman" (92 percent Certified Fresh/$368.8 million) and "Guardians of the Galaxy Vol. 2" (81 percent Certified Fresh/$385.5 million). NOTES: "S-M" was the top grossing domestic film of 2002. Sony reportedly considered a wide range of directors for "Spider-Man" before Sam Raimi was brought on board – including (alphabetically) Jan de Bont, James Cameron, Chris Columbus, Roland Emmerich, David Fincher, Ang Lee, Tony Scott and M. Night Shyamalan. Tobey Maguire reportedly was cast as Spidey because Sam Raimi liked his work in the 1999 drama "The Cider House Rules." The "Rules" cast was nominated in 2000 for the Screen Actors Guild's Outstanding Cast in a Theatrical Motion Picture, SAG's equivalent of a Best Picture nom. Kate Hudson reportedly was an early choice to play Mary Jane Watson, but decided instead to star in the 2002 war drama "The Four Feathers." That seems to have been a big mistake as "Feathers" opened Sept. 20, 2002 to just $6.9 million. It wound up doing $18.3 million domestically and $11.6 million internationally. In 1986 the Cannon Group was planning to film "Spider-Man" and subsequently ran a trade ad announcing the start of principal photography would be Nov. 14, 1988. Instead, Cannon wound up selling its Spidey rights to Carolco Pictures, the high profile 1980's foreign sales rep turned 1990's big budget action films producer – among whose many productions were "Total Recall" (1990), "Basic Instinct" (1992) and "Cliffhanger" (1993). Carolco ultimately sold its Spidey rights to Sony Pictures Entertainment, which finally brought it to the screen. OPENING WEEKEND (# THEATRES): $115.8 million for the four day weekend (4,152) with a six day cume of $180.1 million. NOTES: "S-M2" was the second biggest grossing domestic film of 2004. Its opening at 4,152 theatres was the second biggest ever at the time – after "Shrek 2's" slightly bigger opening at 4,163 theatres May 21, 2004. In its second weekend, "Shrek 2" expanded to 4,223 theatres. Tobey Maguire almost had to leave the film because of serious back pain problems. Jake Gyllenhaal was preparing to step into the physically challenging role when Maguire felt well enough to be able to return. The sequel was originally going to be called "The Amazing Spider-Man." That, of course, became the title for the series reboot in 2012. NOTES: "S-M3" was the top grossing domestic film of 2007. Its opening at 4,252 theatres beat the 4,223 theatres "Shrek 2" had in its second weekend in May 2004. Sam Raimi reportedly wasn't a big fan of how "S-M 3" turned out and had hoped to go on to direct a much better fourth episode. At the time there were plans to produce three more episodes, but none were made. Instead, a franchise reboot was in theatres five years later. (4) TITLE: "The Amazing Spider-Man"
NOTES: "TAS-M" was the seventh biggest grossing domestic film of 2012. Sony was going to make this episode as "S-M 4," but in the end wound up rebooting the series. At one point, there was talk of signing Raimi, Maguire and Dunst to deals to make three more episodes. Creative differences reportedly put an end to that idea and a brand new team was assembled. 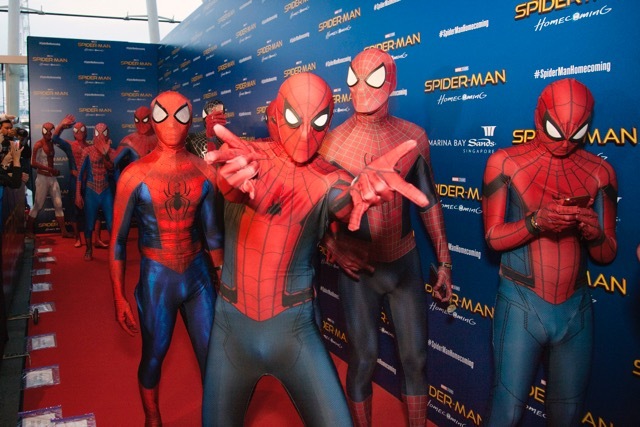 Before Andrew Garfield was cast as Spidey, a wide range of other well known actors were considered – among them (alphabetically): Jamie Bell, Michael Cera, Zac Efron, Taylor Lautner, Joseph Gordon-Levitt, Robert Pattinson, Daniel Radcliffe and Anton Yelchin. (4) TITLE: "The Amazing Spider-Man 2"
NOTES: "TAS-M2" was the 12th biggest grossing domestic film of 2014. The character Mary-Jane Watson doesn't appear in the film, but Shailene Woodley was cast in the role and filmed some scenes. These didn't get into the movie due to efforts to simplify the story by reducing the number of characters. There were plans to do an "Amazing Spider-Man 3" episode and a "Sinister Six" spinoff, but Sony opted instead to develop "SS" and not proceed with "AS-M3." Subsequently, Sony and Marvel worked out a deal to produce a new "S-M" franchise that's part of the Marvel Cinematic Universe. "Homecoming," the reboot's first episode, is produced by Marvel production chief Kevin Feige and former Columbia Pictures chairman Amy Pascal. Bottom line: Last weekend's domestic ticket sales were about $208 million, per comScore, down 4.6 percent vs. $218 million a year earlier when "The Secret Life of Pets" was number one in its opening weekend with $104.4 million. The domestic boxoffice to date this year is $6.056 billion, according to comScore, down a marginal 0.1 percent vs. $6.062 billion this time last year. Last week 2017 was ahead by a marginal 0.3 percent. Hollywood handicappers are buzzing about a muscular opening this weekend in the $60 million to $80 million range at about 3,800 theatres for 20th Century Fox and Chernin Entertainment's PG-13 rated sci-fi action adventure "War for the Planet of the Apes." Its current 92 percent fresh RT score suggests that moviegoers will be clicking to buy tickets. Directed by Matt Reeves ("Dawn of the Planet of the Apes"), it stars Toby Kebbell, Andy Serkis (as Caesar) and Judy Greer. "War" is the ninth episode in the franchise that began way back in 1968 (when ticket prices were much lower) and has grossed about $647 million domestically. This is the third episode since the franchise's 2011 reboot.